You may be wondering how President Benson’s comments are connected (in my mind) to LDS apostle Nelson’s. Mr. Nelson was making the point that popular opinion does not trump the Word of God (an idea that I whole-heartedly agree with!) while President Benson was using the (popular) opinion or testimony of “millions” as supporting evidence for his assertion that the Book of Mormon is true. Joseph Smith claimed that God sent him to restore the one true church to the earth. He claimed to receive clarification of old doctrines and brilliant revelations of new/lost doctrines from God for a world “groveling in darkness.” Over fifteen million people today testify that Joseph Smith was a true prophet and that (nearly) all he taught is true. The temptation for some folks may be to prioritize this public opinion above the Word of God. Therefore, I urge you to “Take up the Bible, compare the religion of the Latter-day Saints with it and see if it will stand the test,” (Brigham Young, May 18, 1873, Journal of Discourses, vol. 16, p. 46). Be very careful in this for God says, “Woe unto them that call evil good, and good evil; that put darkness for light, and light for darkness” (Isaiah 5:20). This entry was posted in Book of Mormon, Mormon Scripture, Truth, Honesty, Prayer, and Inquiry and tagged Book of Mormon, Ezra Taft Benson, General Authorities, General Conference, Joseph Smith, LDS Church, Mormon Church, Mormonism, Russell M. Nelson, True Church, Truth. Bookmark the permalink. Is it just me or do Mormons seem to utilize arguments when they are convenient and discount them when they are not? Do we, as Christians, do that? If millions claim that the book of mormon is true, and thats enough to equel truth, them when millions of us claim it is false then that proves it is false. Thats stupid logic, lets examine evidence and facts. The 15 million number(?). It must be remembered that that’s the number on the rolls of the LDS church. It’s been estimated that two-thirds of those 15 million people are inactive members. When it comes to the BoM and it’s historical accuracy, what counts is that the LDS member “knows” that the BoM is true. That’s personal and direct revelation from the Mormon god, so the believers tell us. It’s all a big game. Mormons will tell prospects to pray in order to gain this confirmation of truthfulness. Then when the person doesn’t get the feeling, they are told that they must not only pray but read the BoM with a humble and sincere heart. When that doesn’t do the trick, the prospect is told that they need to read it as many times necessary until they get the feeling. The only acceptable answer, therefore, is that the BoM is true. That’s the fool’s game that is played by the Mormon missionaries. You asked, “Is it just me or do Mormons seem to utilize arguments when they are convenient and discount them when they are not? Do we, as Christians, do that?” We all do that from time to time. It’s just more evidence that we as humans are not perfect, never will be, and need God’s grace because the Mormon concept of “faith plus works” will still leave all of us unworthy of heaven. Buff, true, but at what point do we become as guilty as the LDS in that regard? If so, is there a problem in our using the argument against them? There’s nothing wrong at all with pointing out to Mormons that they are using flawed logic in some of their arguments. Keep in mind, though, that everyone is sometimes guilty of the same thing. It’s only natural when we care deeply about something and want to protect it. Sometimes we speak too soon. And when a Mormon feels hurt or wounded by something we say, and that happens often, they are likely to respond in kind and not be entirely logical. Bill McKeever just did a very scholarly article for Mormon Research Ministry explaining the various logical missteps we all make occasionally. Not to put too fine a point on it, but sometimes we assume the Bible is much clearer in its interpretation than it actually is. Not every authentic scholar or pastor will read the same verses and walk away with the same understanding. We should be prepared, especially with Mormons, to support our interpretations of the Bible with facts and clear, scholarly logic. Interestingly enough the CoC Mormon sect give their members the option of how they view the BoM. They can say, for example, that it’s a spiritual book rather than an actual history. I think it’s pretty obvious that they’ve figured it out. One of their members told me that in his congregation he can’t remember the last time it was referenced in a service. The problem is, the dedicated LDS member has bought the BoM emotionally and now they are trying to justify it rationally. It can’t be done. That’s why the defense of the BoM is flimsy and one that only a true believer would accept. The desire to believe it is very strong. It’s dope to a TBM. This particular reasoning has been used by Mormons in order to convince investigators that the Mormon church today is the only true church of Jesus Christ . However, this reasoning is flawed simply because ( for sake of argument ) even if the Book of Mormon was the Word of God that doesn’t necessarily prove that the Mormon church today is Jesus’ only true church whose leaders alone teach the truth about God and preach the true gospel of salvation . Why? Because Joseph Smith slowly drifted from the truths he originally taught his flock were gospel truths and succumbed to personal apostasy . Thus the church after his death continued his false teachings , and today it is still guilty of not admitting their error. ” We do not indorse the teachings of any of the so-called Mormons or Latter Day Saints , which are in conflict with the gospel of our Lord and Savior Jesus Christ , as taught in the New Testament and the Book of Mormon . They have departed in great measure from the faith of the Church of Christ as it was first established , by heeding revelations given through Joseph Smith , who , after being called of God to translate His sacred word — the Book of Mormon — drifted into many errors and gave many revelations to introduce doctrines , ordinances , and offices in the church , which are in conflict with Christ’s teachings .” [ p. 4 ] . Whitmer believed the Book of Mormon to be true , but not the Mormon church . Thus showing how Pres. Benson’s reasoning is simply not strong enough to embrace . To evaluate Mormonism we must zero in on it’s leaders , their claims and teachings . Today though they try to keep our attention on the Book of Mormon , that’s simply used as a ploy to divert the spotlight away from what they and their predecessors have taught since their arrival on the scene as religious leaders . The Mormon church is not the only true church of Jesus Christ today , because not only have it’s leaders drifted from what the prophets and apostles in the Bible have taught about God and salvation , but they have left important teachings in the Book of Mormon behind also . Because of this behavior the Mormon church today has no exclusive authority . Mormon leaders are like others who have succumbed to ” looking beyond the mark ” [ Jacob 4:14 ] by ” teaching for doctrine the precepts of men” [ Mk 7:7 ] . And isn’t it ironic that Joseph Smith taught that early Christian leaders apostatized from the truth by changing Christ’s doctrines and becoming morally corrupt. Then he did the same thing. It’s fairly obvious to Mormons that their doctrines have changed since Joseph Smith introduced them (at least if they have the integrity and courage to do the research). In fairness, though, when I said Smith became morally corrupt, I was jumping to a conclusion: I was assuming that sleeping with young girls and the wives of other men, lying about it to church members and the public, and slandering or physically attacking anyone who found out, are signs of moral corruption. A lot of Mormons would disagree with me. They would say that Joseph was ordered to do that by God in order to protect the Church and the institution of polygamy. Really. I’m not kidding about that. Either that, or most Mormons will simply block out that thought and refuse to discuss it. Denial is not just a river in Egypt…. you know if the LDS had ^THAT^ level of confidence in its scripture it wouldn’t have to dabble in self esteem boosting affirmations by declaring its seeming popularity. RE Baptism for the dead…. I suppose it depends on the original translation of the word ” dead ” I know I’ve probably just shot myself in the foot with that but I am only thinking aloud. Another good article with plenty of spare coffee beans in the comments section…. Rhythm , you did’nt shoot yourself in the foot . The meaning of I Cor 15:29 is not very clear , and so it’s wise not to invent doctrines from it etc. 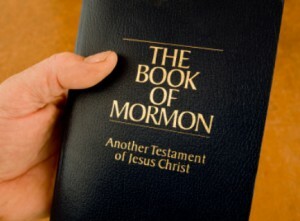 Since the topic in this thread is the Book of Mormon I find it interesting that the alleged prophets in it did not teach Mormonism’s baptism for the dead doctrine , especially since Mormon leaders today can call this doctrine : “….. this most glorious of all subjects belonging to the everlasting gospel ….” [ D&C 128: 17] . Also , the Mormon doctrine of temple marriage has been referred to as : ” The crowning Gospel ordinance requisite for Godhood is celestial marriage .” [ Church authorized manual , ” The Gospel Through the Ages , 1945 , p, 118 ] . These are two SAVING TRUTHS of the Mormon gospel — they are not taught by the true apostles of Jesus in the New Testament , nor the men He supposedly commissioned to preach the gospel of salvation in the Book of Mormon . I’m sticking with the Bible . The New Testament reveals what is required for a sinner to experience complete forgiveness , be accepted by God , and receive the gift of eternal life — the gospel . Was reading up on Baptism for the dead in relation to any other ” christian ” sect practicing it in the past and the two names that came up were Marcion and Gnostics…Pretty much kills it right there. The key to that verse is the allusion Paul makes using the word “they”. It’s exclusionary. If he had said “we”, then the early church practised in some form the Baptism of the Dead. Since Paul uses “they” he’s referring to those outside the church, practising baptisms for the dead because they believe in a resurrection. Paul is simply explaining a belief in a resurrection not validating in any sense baptisms for the dead. Mormon President Ezra T. Benson mentioned how LDS have ” the witness of the Spirit ” which tells them the Book of Mormon is true . Mormon leaders have long realized that by placing the main emphasis on feelings as the basis for how their flock can confirm the truth of what they teach them , then that will keep them submissive . Mormons feel the church is true , what their leaders teach is true , and that the Book of Mormon is true because they experience a feeling which they interpret is coming from the Holy Ghost . If their life ,thoughts and actions are pure according to church standards then what they feel after praying about if their church is true , or if the Book of Mormon is true they will hear from the Holy Ghost by way of impressions , feelings etc . Placing to much importance on trusting feelings is a risky venture when deciding on the teachings of anyone who claims to be a prophet these days — Jesus pre warned all living in the latter days to expect false prophets trying to gain a following ( Matt 24:11 ) , thus caution is crucial when listening to any prophet / messenger who claims they have heard from God or angels . ( Jn 14:17 ) then He will not give a good feeling about false doctrine , or counterfeit revelations . It may be time to resurrect what I posted a few months back regarding the difference between “chapel” Mormons and “internet” Mormons. The type of Mormons with these characteristics have been around forever only under different labels. Basically the “chapel” Mormons believe what they are told, don’t question and are absorbed totally in the Mormons fantasy. These folks will accept any explanation the LDS church or FARMS/FAIR will offer no matter how preposterous. The “internet” Mormons aren’t quite so gullible and not as naive as the “chapel” Mormons. They stay in the LDS church knowing all of the problems associated with Mormonism. The “chapel” Mormons are more apt to accept an explanation like, “millions of people bear witness to the BoM” as proof that the tome and the LDS church are true. The “internet” Mormons are more inclined to acknowledge (at least to themselves) that the BoM is not an historical account of actual events, but see some spiritual value in it. The problem the LDS church has today, is to convince enough people that the BoM is true and the LDS church is true in order to keep money flowing into the coffers of the organization. The sect also needs future leaders. Where are these leaders going to come from; the ranks of the “chapel” Mormons or the “internet” Mormons. The latter probably have more intellectual horsepower and the leadership potential to take over. That’s when the changes will come, that is if they can keep the “chapel” Mormons from jumping to the FLDS. The FLDS Church is now so completely different from the LDS Church that there’s little likelihood any “chapel Mormons” will find it attractive. Those chapel Mormons you mentioned are creatures of habit. They value the Church’s social structure and peer pressure, and don’t really care much about its doctrines or history. As you said, though, they’re not very reflective or insightful; they just trudge along with their families. The chapel Mormons will provide leadership for the Church, and you should be grateful for that: they spend so much time playing basketball and arranging flowers that they aren’t noticing that their children are drifting away from the Church. Interesting that you should mention the chapel Mormon children. In a video presentation, Grant Palmer mentioned that something like fifty percent of Mormon missionaries go inactive within five years of completing their mission. He said that it’s a serious problem because it’s from this group that the future LDS leaders are suppose to come from. The leaders of the Mormon church claim to be latter days prophets , men picked by Jesus to run His church and teach His gospel truths . These men offer “modern day” revelations from God . That was a message supposedly from Jesus through His prophet on earth . The prophet is Warren Jeffs . Mr Jeffs is a latter day prophet . Jesus pre warned us that in the latter days many false prophets will arise — Matt 24:11 . The men who lead the Mormon church , and Mr Jeffs are two examples of the prophets Jesus warned about which would come in the latter days . Finally someone who is thinking. ………….what exactly do you mean by that comment? No drive by shooters here please. Give us the courtesy of more than a troll like post! Catty, I don’t think I am any different than anyone else, or that I am thinking more than anyone. I do however, try to be honest in how I present information and arguments. I am aware how similar various tactics in apologetics can seem to those outside religion. Its important that we recognize that, I think. I am not always perfect in living that out, though. That said, I think there are very real differences between Mormonism and traditional Christianity. Nonetheless, they both come down to faith, don’t they? So, often arguing the various distinctions can seem tedious and pointless. That does not diminish the real and tangible differences.